Full grain leather, dual density rubber sole, Nail proof LENZI L-PROTECTION midsole. 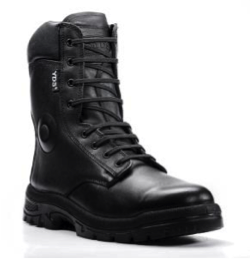 Cut Resistant lining, Duel density rubber sole for durability, Fire retardant laces and thread, Full length footbed for instant comfort, Downward facing seams for petrol to run off, soft leather padded collar for secure fit, Ankle support, shock absorbing ankle protection and protective ankle impact zone, All key seams are double stitched for long life, Impact steel toe cap to 200 joules, Heat resistance sole to 300 degrees. Lightweight high-performance protection. 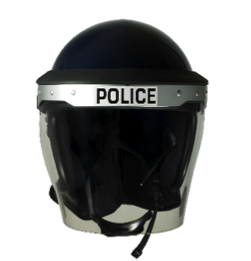 Designed for both maximum comfort and protection incorporating state of the art ballistic composite technology in construction and materials The helmets feature an improved harness system that not only increases balance and fatigue resistance, but also reduces the overall weight. Level 2 Guards have been shown to resist displacement from limbs and torso to a level beyond that required by BS 7971-4. They have been assessed for comfort when worn for extended periods of time, ease of donning and any restriction to normal movement during physical activity and have been shown to have an excellent ergonomic score for the requirements of BS 7971-1. 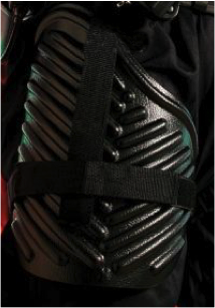 This product is designed to provide protection, without impeding free movement of the body, against the risk of injury that could be caused by missiles thrown or skated, strikes by batons, poles or bars, kicks, punches and catapulted missiles that may be used against officers in operational or training scenarios. 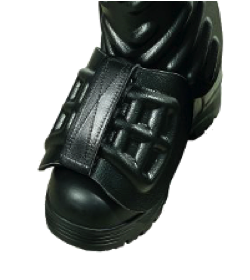 The strap of the Metatarsal Guard passes under the laces of the boot and gives protection to the fragile bones of the foot. 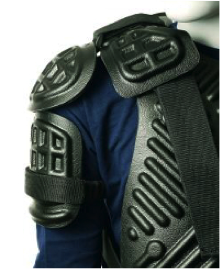 The shoulder guard is held onto the wearers body armour by passing the 50mm elastic guard is then secured by feeding the elastic strap through the plastic guard. 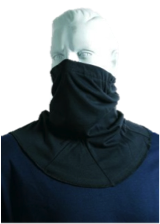 The shoulder guard is then secured by feeding the elastic strap through the plastic guard and onto the shoulder, fastening by Velcro. The upper arm is then secured using the 30mm Elasticated strap. 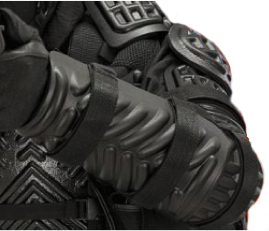 Shoulder and upper arm guards are in pairs. Yellow Velcro on the upper arm guard strap signifies the right arm. Shin and knee guards are in pairs. Yellow Velcro on the knee strap signifies the right leg. Each guard is secured with three elasticated straps. 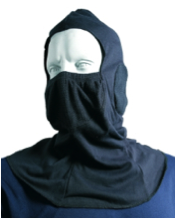 These garments conform to EN531 protective clothing for industrial workers exposed to heat. They meet the requirements for Limited Flame Spread, Radiant Heat and Convected heat. Baseball cap design in black. 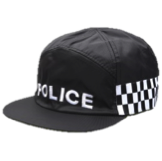 ‘POLICE’ logo to front in white embroidered lettering measuring 100mm wide x 35mm high. 3 x rows of black/white chequered dicing to sides from edge of logo to adjustment panel to be approx. 40mm in height from bottom seam of cap. Size adjustment panel to rear offering full size range adjustment. Peak to be of firm construction and measuring approx. 700mm in length and 1700mm in width.